AFTER long anticipation, the Hostess City of the South welcomes award-winning Husk, a restaurant birthed in Charleston that embodies true southern hospitality and honors regional fare in its traditional form. Helmed by James Beard award-winning celebrity chef Sean Brock and Eater Atlanta’s Chef of the Year Tyler Williams, Husk Savannah finally opened its doors on January 5. Delays in the grand reveal were due to the historic snow-pocalypse that iced over Savannah last week. While this snowfall may have made history, The Neighborhood Dining Group President David Howard believes that Husk’s opening has also made its mark in Savannah’s history through the restoration of the grandiose building located at 12 West Oglethorpe Ave. The once abandoned three-story dwelling in which Husk resides is rumored to possess paranormal activity, earning its place as one of the most haunted buildings in Savannah. The white Colonial was originally constructed in 1897 as a residence of Juliette Gordon Low’s cousin. Years later it became an Elk’s Lodge followed by a Montessori and Performing Arts School. In 2009 the building caught fire, causing substantial destruction. It was not until 2014 that developer Wakely Properties bought the building and began the restoration process. Over the last three years Husk has partnered with Wakely in order to revitalize the property to its original grandeur. Fresh shucked oysters with an antique perfume bottle filled with house made mignonette, peanut horseradish and cocktail sauce. 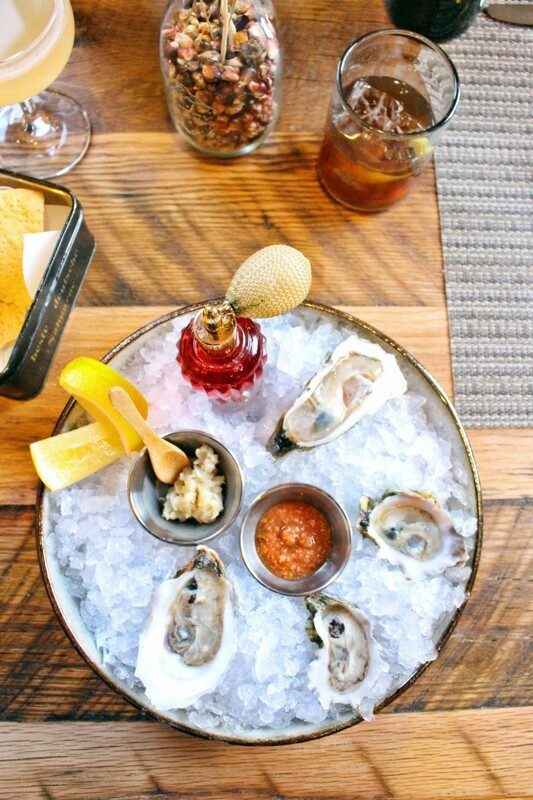 The origins of Husk date back to 2010 when the flagship restaurant released in Charleston. “Originally, we were going to open a Creole restaurant. After months of serious research, I decided to take the more ambitious route and start my lifelong journey of exploring the possibilities of Southern Food as a Region,” Chef Brock recollects. Growing up in rural Appalachia, Brock was raised with this sense of reverence and connection to what was available, cooking and eating from the garden every day. Brock’s philosophy of food and a “sense of place” are the major contributing factors of Husk’s success. “The communal pride that comes along with a region’s cuisine is a very powerful thing,” Brock affirms. 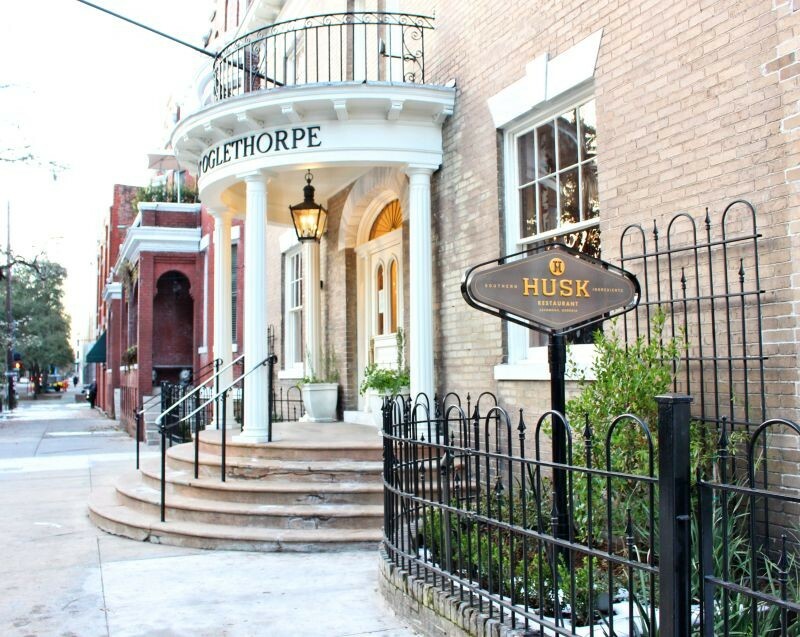 Following the acclaimed reputation of Husk Charleston, the brand expanded to Nashville, Tennessee, in 2013, Greenville, S.C., in November 2017 and now the heart of Savannah’s Historic District. Chef de Cuisine Tyler Williams joined the Husk Savannah team given his love of culture and new discoveries. Williams was born and raised in a small farming community outside of Lansing, Michigan, where the preservation of local ingredients and farm-to-table principles were indoctrinated in him at a young age. This, coupled with his longstanding culinary career, brought him to our city. 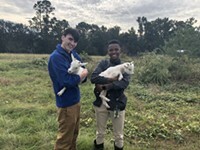 Williams brings “immense culinary talent and a true appreciation for preserving the relationships with local farmers, the land, and the ingredients that are essential to Southern heritage,” states Brock. The Neighborhood Dining Group intentionally established all Husk locations in historic buildings in order to preserve the structures similar to the way that they do the Southern Foodways. “It's very important that Husk feels like a cozy home to provoke nostalgia,” Brock enlightens. When entering the newly renovated building, diners are confronted with a straight shot view of the partially open kitchen. While the kitchen was refurbished in its original location, revamped essentials of a modern restaurant kitchen took the place of the once-1930’s commercial equipment. The first floor provides three intimate areas that are set up like formal dining rooms. Neutral tones, wood flooring, original fireplaces and floral period-style curtains evoke the homey aura that was intended. A wide stairwell, paced by broad landings leads upstairs to the second floor dining alcoves that echo the same southern home-style presence as downstairs. Past this area, a hallway leads to Husk Savannah’s most opulent space, the original ballroom in all its lavished splendor. Towering ceilings with cascading glitzy chandeliers overlook sleek horseshoe bar with leather back chairs. The walls are adorned with gold geometric designs and vibrant artwork created by former SCAD student Simon Cooper representing Savannah greats like Oglethorpe and the city’s initial grid layout. The third floor consists of an expansive wooden community table surrounded by windows that peer out into the streets of Savannah. It is here where ideas are made, probable supper clubs will convene and recent paranormal activity has been reported. When it comes to intentionality and vision, the Husk team not only conducted in-depth research regarding the original elements of the historic structure, but also the regional cuisine. 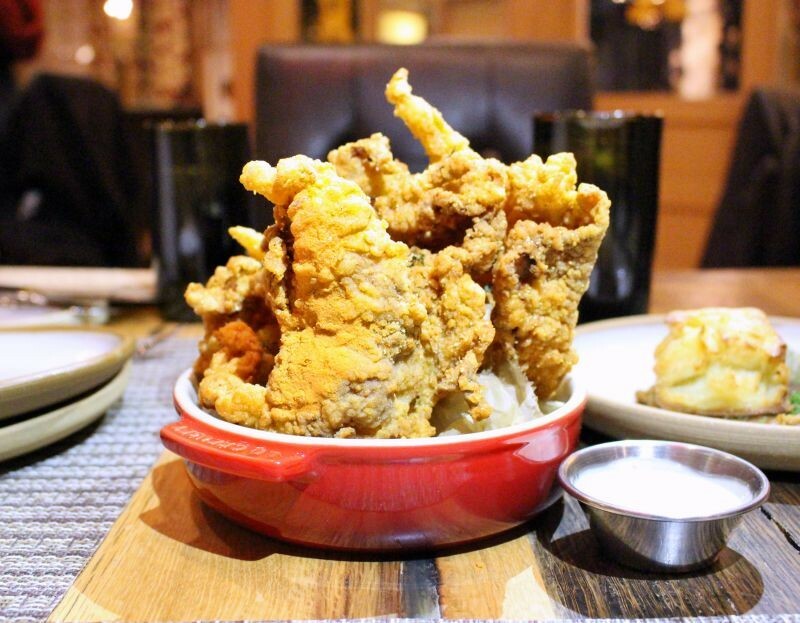 The Husk Fried Chicken Skins with white barbeque sauce. Williams and Brock plan to impact this city’s food scene by “exploring the possibilities of Savannah’s Foodways and hospitality...only using regional ingredients and tireless research”. Williams will spearhead the menu development and food sourcing, utilizing only the peaky-est harvested products from local farmers, adhering to Husk’s philosophy to “showcase a depth of flavor that will transport diners to a time of greater food integrity, honesty, and purity”. Husk’s ever evolving menu changes relentlessly, relying on seasonal offerings. “We put dishes together based on the products that walk in the back door every day. 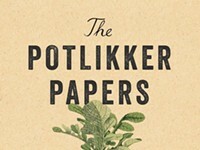 We have spent six months getting to know the farmers, fishermen and artisans of this region—ironically, they write the menu—we simply take their work and figure out a way to get it on a plate so their story can be told,” Brock reports. For now, only dinner is served, but brunch and lunch are in the near future. The grand opening menu boasted Husk classics like Fried Chicken Skins with white barbeque sauce and reimagined southern staples such as Lowcountry Shrimp and Hominy instead of grits. Distinct varieties of the bivalve were nestled in ice accompanied by an antique perfume bottle filled with house made mignonette. If spritzing on this piquant sauce does not tickle your fancy, dab on a bit of homemade peanut horseradish or pungent cocktail sauce. The HUSK Fried Chicken Skins were nothing to pass up. These hearty full skin golden crisps had the crunchy flavor profile of fried chicken without the meat. Immerse them into the white barbeque sauce for a creamy yet zippy punch of vinegar and heat. Ask for more sauce, as this southerner’s ranch pairs with just about everything. The Anson Mills Hoppin’ John with duck confit and scrambled egg can be described as a southern take on a Korean Bipimbap bowl. Tender pulled duck and cracklings were topped with sweet Carolina gold rice, al dente beans and a rich egg mousse. The mousse was whipped like cream, lending an indulgent buttery egg flavor. The dish was topped with green whispers of Rafe’s Nebedaye. Moringa is a plant found in Africa, where it is known as nebedaye, which translates to “never die”, due to its ability to grow in almost any climate or soil. This special ingredient is regarded as a super food. 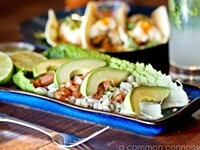 The dish as a whole embodied the comfort of warm familiar flavors with avant-garde preparation. For supper, order a side of Chestnut Cornbread with Georgia Cane Butter, as a tribute to a southern staple. The quick bread is served upside down in a small cast iron skillet, revealing its golden bottom. Given Brock’s passion for heirloom ingredients, Purple Ribbon sugar cane is utilized within the bread mixture and served alongside as pourable cloyingly sweet butter. This type of sugar cane almost went extinct from disease until purveyor Jerome Dixon solved the problem by cross breeding variations to make them resistant. 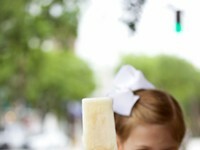 Purple Ribbon sugar cane has since been resurrected and now its story can be told at Husk. For a simply stunning dish that highlights ingredients in their purest form, order the Grilled Bear Creek Farm Beef with Beets and Fennel. Beets are prepared two ways; pressure cooked until tender with rosemary and pureed into a briny paste. The medium rare strip steak melted in our mouths, needing little resistance from a knife. A pool of savory jus accompanied the meat for additional vibrancy. Frisee greens and shaved fennel came lightly dressed with peanut soy vinaigrette. This dish was as farm to table as it gets. 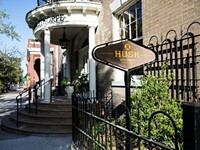 Husk is truly a dynamic addition to Savannah’s restaurant collection. Chef Brock and Chef Williams are determined to simultaneously preserve and enhance this region’s cuisine by paying homage to its history. We, in turn, are experiencing history in the making.